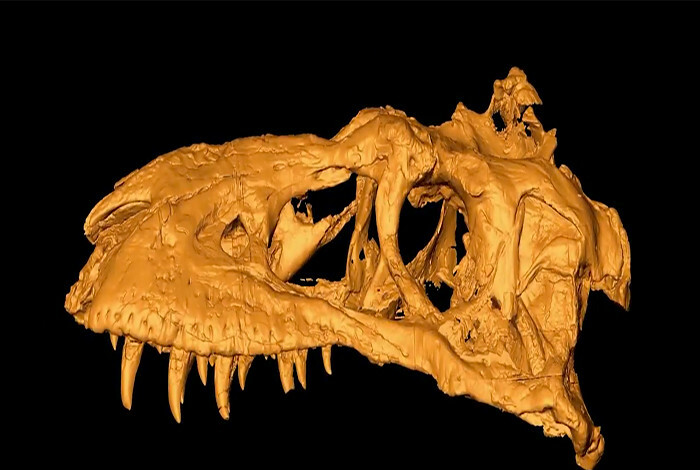 Researchers have exposed the inner structures of the fossil skull of a 74-million-year-old tyrannosauroid dinosaur nicknamed the Bisti Beast. A 3D image of Bistahieversor sealeyi, which was found in the Bisti Badlands in New Mexico and Imaged at Los Alamos' unique facilities. LOS ALAMOS, N.M., Aug. 15, 2017—Researchers using Los Alamos’ unique neutron-imaging and high-energy X-ray capabilities have exposed the inner structures of the fossil skull of a 74-million-year-old tyrannosauroid dinosaur nicknamed the Bisti Beast in the highest-resolution scan of tyrannosaur skull ever done. The results add a new piece to the puzzle of how these bone-crushing top predators evolved over millions of years. This work was funded by Los Alamos National Laboratory capability development funds from the Applied Engineering and Technology division and from National Nuclear Security Administration Science Programs, and through a grant to UNM through the New Mexico Consortium. The team comprised Michelle Espy, Cort Gautier, James Hunter, Adrian Losko, Ron Nelson, and Sven Vogel, of Los Alamos National Laboratory; Tom Williamson, Curator of Paleontology at the New Mexico Museum of Natural History and Science; Kat Schroeder, of the University of New Mexico and Steve Brusatte, of the School of GeoSciences, University of Edinburgh, Scotland.